Sure, your phone comes with a calculator and flashlight. But, there are loads more useful, practical apps that add versatility and utility. Apps for adding multi-functionality to your smartphone device. If you consider yourself as a person that texts constantly, you need an app to help you watch out the surroundings while you are messaging. 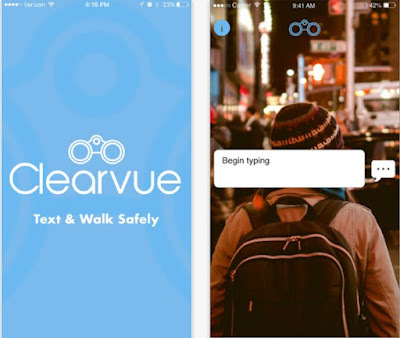 There a few apps for this specific purpose, so we did our research and we have for you one highly helpful utility app for texting and walking – Clearvue. Clearvue is a great and highly helpful utility app developed for all IOS users that need help texting while walking. The app is simply designed to help users text easy and fast while they are being aware of their surroundings. The app is specially created to help users never miss another step again. An effortless way for extreme texters out there that want to create for themselves the easiest and the most wonderful texting experience. texting experience. The fastest and the most effortless texting experience no matter of the location. Download this app on App Store now for 0.99$.